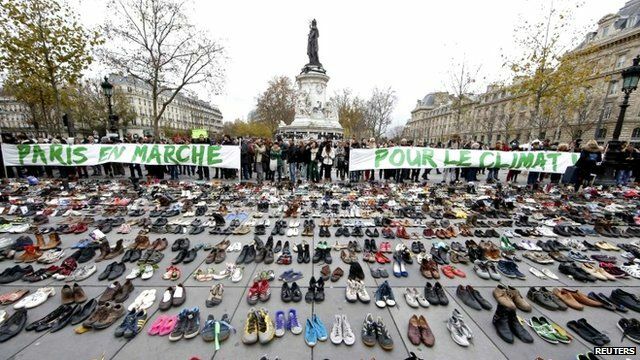 Empty shoes replace Paris climate march Jump to media player Emma Ruby-Sachs, of the Avaaz campaign group, explains why Parisians have been placing pairs of shoes at the Place de la Republique in Paris as a UN climate meeting gets under way in the city. A brief history of climate talks Jump to media player Rebecca Morelle reports for BBC Newsnight on the background to the upcoming summit in Paris. Nearly 150 global leaders are gathering in Paris amid tight security for a critical UN climate meeting. The conference, known as COP21, starts on Monday and will try to craft a long-term deal to limit carbon emissions. Meanwhile Parisians have been placing hundreds of pairs of shoes at the Place de la Republique in the French capital. Emma Ruby-Sachs of the Avaaz campaign group explained the reasons for the gesture.